Over the last week a series of escalating events on the Temple Mount/Haram al-Sharif has threatened peace and security at the holy site and for Jerusalem as a whole. We have created the following primer to help make sense of these rapidly spiraling events and to raise the call for a swift, agreed resolution of the current conflict. The current escalation of events at the Temple Mount/Haram al-Sharif compound (also known as Al Aqsa compound, the Noble Sanctuary, the Esplanade, the compound) began last Friday with a heinous attack that claimed the lives of two Israeli police officers. The three perpetrators, who descended from the compound, fled back to the Mount, where they were shot and killed by security forces. The government then issued orders to close the compound entirely for two consecutive days. The fact that events took place in and around the most sensitive and highly contested site in Jerusalem – itself a core issue of the Conflict - clearly heightens security concerns and creates a situation meriting special consideration. “Appropriate measures” is naturally a relative concept and Israelis and Palestinians clearly diverge on how they perceive the situation. Of central concern is the degree to which security measures may or may not disturb the fragile status quo at the site. The anomalous closure of Al Aqsa for two consecutive days may largely be interpreted as a security measure for Israelis. For Palestinians, it is a severe abridgement of their religious rights and an upending of the status quo. The status quo in place since 1967 concerns management and security arrangements on the Temple Mount/Haram al-Sharif that were recognized in the peace treaty between Israel and Jordan in 1994. Three critical considerations are: 1) the primacy of Muslim prayer rights, e.g. over the right of Jews to visit the site; 2) the division of management authority, which stipulates the Muslim Waqf (religious trust) will manage the inside of the compound and its holy sites while Israel maintains authority for security around the perimeter; and 3) entry arrangements. Determining when the status quo has been breached is tricky, particularly given that it is not written down and in light of the delicacy of how to develop an appropriate security response at times such as these. What is important to underscore is that perception matters and all events that happen on the Temple Mount/Haram al-Sharif will be seen through the political lenses of the multiple parties involved. According to the Waqf, entry arrangements are a key element of status quo arrangements at the holy site; therefore any change to these arrangements should be considered as a change to the status quo. Since 1967, the Waqf has maintained authority for supervising entry to the compound. Installing metal detectors manned by Israeli security forces therefore unilaterally transfers authority from the Waqf and constitutes a change in the status quo. It is important to understand that this is not a specious claim by the Waqf. Until 2000, Waqf officials determined who could enter the Temple Mount/Haram al-Sharif in accordance with the 1967 understandings regarding mechanisms of management and control of the holy site. In 2003, when Israel restored visits of non-Muslims to the Mount (visits that were stopped upon outbreak of the second Intifada), it assumed authority over the Mughrabi Gate, the entry point for non-Muslims. Since then – and particularly as clashes surrounding Jewish entry to the Mount have increased – Waqf officials have repeatedly demanded that authority be restored to them and have even proposed, in exchange, to improve entry conditions for Jewish visitors. Now they see the Israeli Police further undermining their authority to control entry to the compound by assuming control over Muslim entry as well. What Israelis may see as a conventional case of security screening is perceived by Palestinians as an expansion of Israeli control over the compound and a change in the status quo: instead of having the Waqf decide who will enter the Mount, as it has done since 1967, the authority has passed into the hands of Israeli security forces. The Palestinians, who equate barriers and checkpoints as a symbol of occupation, are unable to tolerate what they experience as an infringement on their unimpeded entry into their holy site and the oppression that symbolizes. It should be underscored that the Palestinian community as a whole perceives the use of firearms within the compound as a violation of the sanctity of the holy site and is opposed to the introduction or use of firearms there. Israel’s unilateral decision to install the metal detectors can also be seen as a rollback of one of the key achievements responsible for maintenance of calm at the holy site since the outbreak of violence in 2015: the ongoing cooperation between the Waqf and Israeli Police. After two years absent of Palestinian mass demonstrations on or near the compound, since Sunday afternoon hundreds of Palestinians and police officers have been facing off in close quarters, in a tense political environment and record heat within the Old City. It was precisely this scenario that devolved into severe violence in 2014 and 2015. The typical chain of events: Police close off the Mount to Muslims - Muslims stage protests in front of Police barriers (Note: the right to protest should be a given right, respected by the Police) - ordinary passersby, residents of the Old City, are also held up at the barriers and pressure mounts – a random word or push precipitates a retaliatory gesture – stun grenades are thrown and tensions break out in the Old City - Palestinian TV and Arab networks broadcast videos showing Israeli men and women in uniform preventing Palestinians from entering al-Aqsa - Palestinian anxiety that the Temple Mount movements (radical Jews mission-driven to reclaim sovereignty over the Mount) are gaining traction is stoked by the sight of Israeli security personnel in the Old City, right near the Haram al-Sharif, pushing, shouting and throwing stun grenades at Palestinians. Armed attacks ensue. Since the eruption of tensions, press reports have largely focused on the clashes that have ensued between Palestinians and security forces. Contrary to this narrative, Ir Amim’s field researchers – backed by ongoing reports received by Ir Amim - indicate that this is not an apt characterization of the collective protest. The Palestinian Jerusalemite protest of the past several days is a largely non-violent demonstration of civil resistance in the form of collective refusal to enter the Temple Mount/Haram al-Sharif, group prayers, the signing of national songs and mass rallies surrounding the compound as a show of protest. A majority of the East Jerusalem public has adhered to this protest model over the past week. Tomorrow will mark the second day of Friday prayers since the attack, highly elevating chances of an escalation if an accord has not yet been reached. According to news reports, Israeli defense officials are now calling on the prime minister to concede on removing the metal detectors. In the face of the ongoing protest, and so long as the situation has not spun out of control, we must find creative solutions that will lead to a compromise. Such solutions must involve civil society and religious leaders, both Jewish and Muslim. Ministers of Knesset should take action with the government, the Police and the Waqf to advance a process that will lead to an accord. 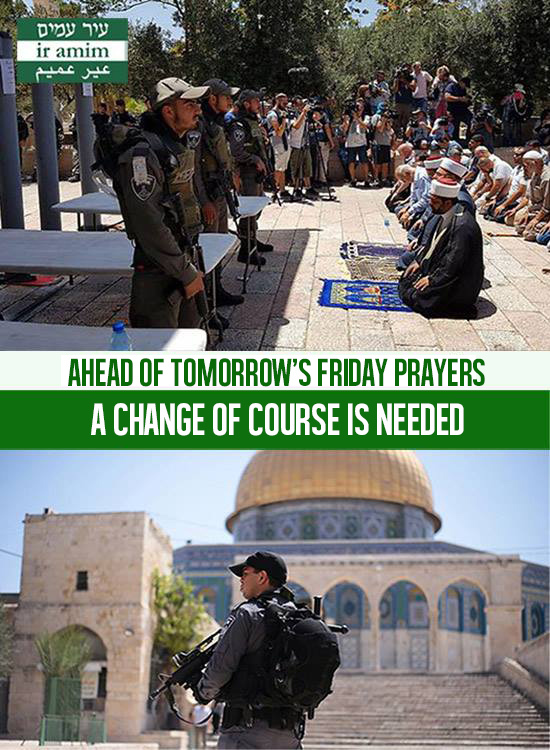 It is in the interests of all of us – Israelis and Palestinians, West and East Jerusalemites, Jews and Muslims – to get life in Jerusalem back on course, particularly before Friday prayers resume. We invite you to reach out with any questions you may have on this complex issue or on the current and future status of Jerusalem as a political issue. Please consider making a contribution to Ir Amim as we work to monitor all of the current developments in our city, and conduct legal and policy advocacy to fight developments that undermine hope for a political resolution on the city. To donate, please click here. Follow us on Twitter: @IrAmimAlerts and Facebook (fb.me/IrAmimEng) to keep current on Ir Amim’s positions on unfolding events in Jerusalem and be the first to access our latest resources. For questions to our “Ask Ir Amim” corner, write to us at info@ir-amim.org.il. For more in-depth information, check out the Ir Amim website.